All Pilates classes and packages are non-refundable and non-transferable. It is compulsory to attend the Reformer Introduction Class for first-timers regardless of your Pilates reformer experience. We encourage sharing of bundles between loved ones. Joining fee per new member is required. Please arrive 10 minutes before class as all classes start sharp at the scheduled time. To prevent disrupting an on-going class, late-comer who is late for more than 10 minutes will not be able to join the class and your class will be forfeited. 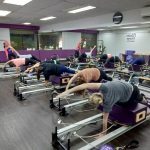 All group Pilates class bundles must be utilized within the respective expiry date and may be used for all group classes available on our class schedule. Strictly no extension on the validity of bundles. A pair of clean socks is compulsory at every class. You will not be able to attend the class if you do have socks. You can buy new socks at the reception if you forget to bring yours. Please wear fitting, comfortable workout attire (Fitting T-shirt/Tank top, Shorts/Slacks/Tights) for your Pilates workout so that Instructors can see your posture easily. You may bring a small towel or water bottle if required.